The thesis defense is the review where we either get a green-light to go into production mode or you are asked to present your work again in one week to the thesis instructors. Obviously, for that reason, it is the most stressful review. I found out the other day that I passed!! 🙂 Now, I am going into production mode for the next 4 weeks until our public review. Here are the boards that I presented last Wednesday. 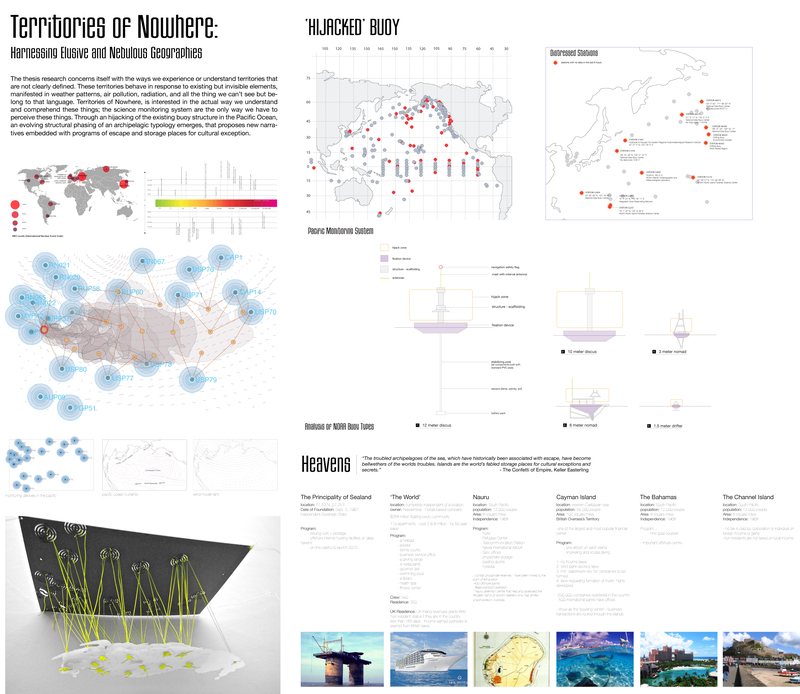 The project started off by defining these nebulous geographies, looking specifically at oceanic current movements, wind patterns, international shipping routes, changing political borders, and the existing monitoring systems in the Pacific Ocean. Sited in the Pacific Ocean, the system of scientific buoy’s are at the heart of the monitoring that is taking place. This project hijacks this system, which provides us information about this nebulous data set regarding this constantly moving and evolving environment. This sets up the buoy system as the only way we have to monitor and the reason for the hijacking of the buoy. 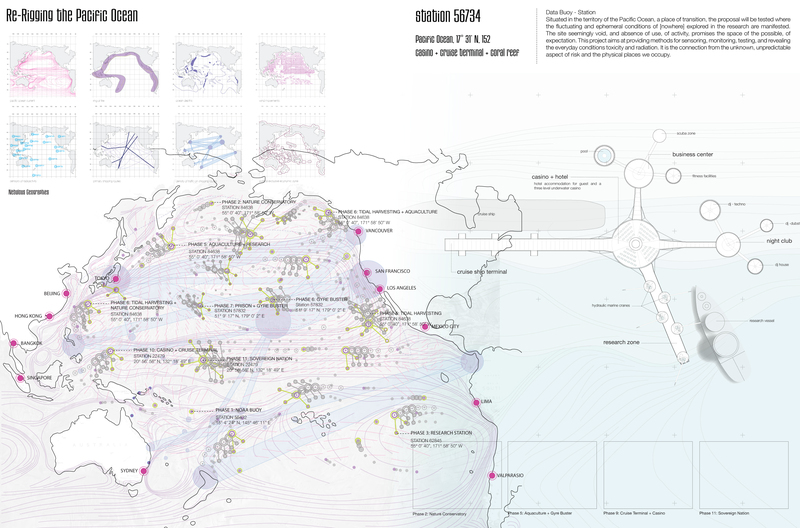 The thesis proposes a new Pacific archipelago, a re-rigging of the Pacific Ocean through a urban network of transient data buoy stations that evolves through a series of phasing, that talks about the structural phasing and growth of these buoys as they evolve and are embedded with new and changing narratives. The proposal becomes more a system of phasing; each of these phases has certain conditions it is responding to programmatically, represented through a notation system. All the phases are coded to traits inherent in each phase. Starting at phase 1, the existing NOAA buoy (National Oceanic and Atmospheric Administration), currently conducting oceanic, and geophysical observation, it is testing the water temp, wave height, global positioning, wind speed and direction, air temp + humidity. Through this 11 step phasing, each of the buoy are growing and adopting these other narratives and programmatic pieces. 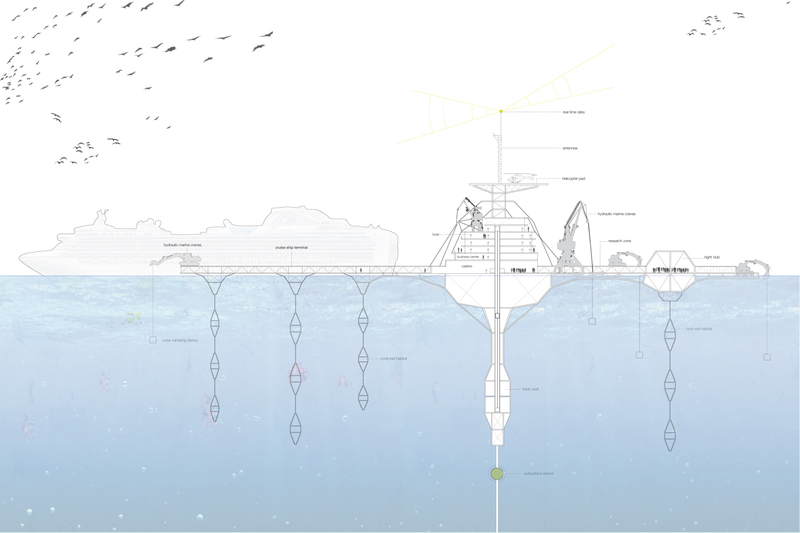 For example phase 2 becomes a nature conservatory, still embedded with the science monitoring component but now the structure provides shelter and substrate for various marine life, fostering new ecologies for migrate seabird colonies or sea-lion populations. Phase 11, becomes the most extreme phase, which would be a sovereign nation embedded with an offshore tax haven, its own bank and currency system, apartments, hotels, this very obscene stage. 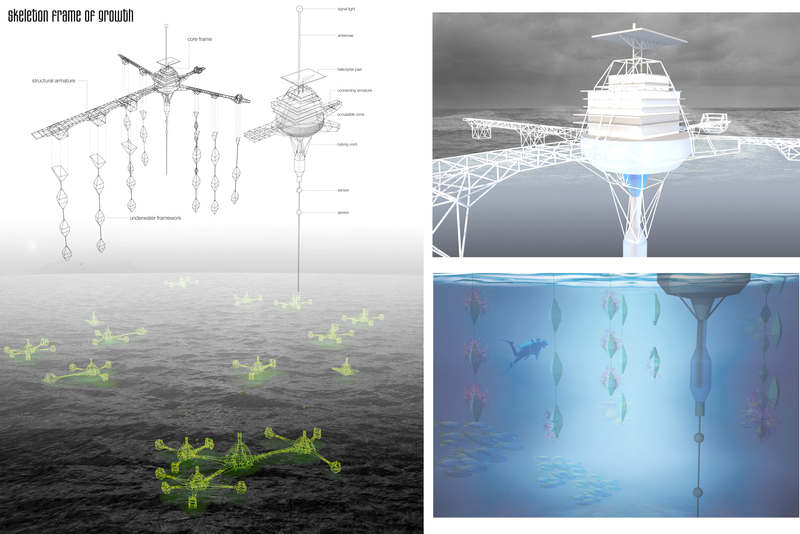 There are some things that remain in each of the phases- the tidal harvesting and more infrastructural aspect would remain as it develops more in these further phases. It is an aesthetic question that tells me who is in control, if it is the casino owner, it is going to be super slick, if it is mad max (dystopian action film) style or an appropriation by pirates then it would have a different feel or appropriation. Right now I have just tested out one of these phases, the nature conservatory, might be very different in terms of surface, surface for birds to occupy, some of the seabird need a cliff environment, some need sand bars to generate food, their natural habitat then informs the form. Currently I am taking phase 10 the casino, night club, and offshore banking phase and testing it out architecturally. It is hijacking the buoy but also looking at other ways of occupying the ocean, the are various forms of islands, artificial islands, represented as tax heaven, islands that are sovereign nation, that they are somewhere and nowhere at the same time. The edge becomes all about hosting this of the water productive port- active- much more machine-like aspect, not just about casino but other infrastructure is overlaid within the system. At the large scale these phases would start to cluster – although my site is the Pacific, there are certain areas where different phases would exist and build up an intensity. For example the currents are invisible to use, but has a physically manifestation of where these phases start to be located – they may be located in proximity to tidal flow, or urban areas for instance. These stations take on a life of there own; following currents, interaction with other stations of various phases, and sharing each other ecosystems. Each of the phases begin to take on certain characteristics, such as certain seabird migrate in the northern pacific, and along the coast, while the cruise line have distinct paths cutting through the pacific that the cruise terminals would be located along. You then begin to have a nature conservatory and a casino overlapping- similar to sustainable tourism today, that they become overlapping ecosystems – some human habitats, others more infrastructural – and productive systems such as energy harvesting, while others are marine life habitats. The overhead view (upper left) is what one may see from an airplane from Hong Kong to SF, like one see the lights from a city these are the new lights of the Pacific, unlike the ordered grid one may be used to viewing, this represents the new constellations that are formed in the Pacific. This corresponds to the nowhere territory, allusive and transparent but of a specific location, that belongs to this other territory.